What is KDETools OST to PST Converter? KDETools OST To PST Converter is a popular OST to PST conversion tool capable of recovering and retrieving corrupted and damaged OST files and transform them into various formats, including PST, EML, and MSG to mention a few. 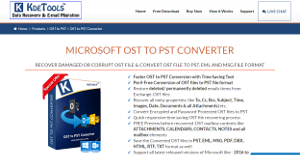 This powerful OST-PST converter promises secure, fast, and peril-free conversion of your OST files to PST format, saving you tons of time that you can use on other pressing matters. KDETools OST to PST Converter can recover email items that are deleted permanently from your Exchange.OST files. Meta properties such as To, Cc, Bcc, Subject, Time, Images, Date, Documents and all Attachments can be recovered as well. Even OST files that are protected by password and heavy encryption are easily converted by this tool. KDETools OST to PST Converter makes it easy for businesses and organizations to turn their OST files into PST format. The conversion is becoming a standard practice in today’s settings as PST files are easily accessible since they are stored on the hard drive, not to mention the added security that comes with keeping your files on your own servers. With KDETools OST to PST Converter, users benefit greatly from a fast and safe conversion process. Not only that, it converts all elements and meta properties such as Cc, Bcc, Images, Subject, Time, etc. This application can even convert OST files that are heavily encrypted and protected by passwords to PST format with ease and speed. And if you want to convert your OST files into something else, KDETools lets you do that. Just pick your preferred format, from EML, MSG, PDF, DBX, HTML, RTF, to TXT, and you’re good to go. If you have OST files that were made using dated versions of Microsoft, such as Windows XP, Vista, 7, and 8, KDETools OST to PST Converter is can still work wonders and turn them into PST files effortlessly. When you are saving PST files, the system maintains the original structure and hierarchy of your internal folder. That means while the tool is creating a healthy PST file, the original files and its source remain the same. No changes are applied or implemented in the internal hierarchy of emails or folders. If you are considering KDETools OST to PST Converter it might also be a good idea to analyze other subcategories of Best Document Creation Software listed in our base of B2B software reviews. Every organization has different needs and needs a software that can be customized for their size, kind of staff members and buyers, and the specific industry they are in. For these reasons, no platform can offer perfect functionality off-the-shelf. When you try to find a software product, first be sure what you need it for. Read some KDETools OST to PST Converter reviews and ask yourself do you want basic features or do you require complex tools? Are there any industry-specific tools that you are searching for? Obtain the answers to these questions to help your search. There are multiple elements that you need to mull over and these include your budget, specific business requirements, your organization size, integration needs etc. Take your time, try out a few free trials, and finally choose the system that offers all that you require to enhance your firm competence and productivity. How Much Does KDETools OST to PST Converter Cost? We realize that when you make a decision to buy Document Creation Software it’s important not only to see how experts evaluate it in their reviews, but also to find out if the real people and companies that buy it are actually satisfied with the product. That’s why we’ve created our behavior-based Customer Satisfaction Algorithm™ that gathers customer reviews, comments and KDETools OST to PST Converter reviews across a wide range of social media sites. The data is then presented in an easy to digest form showing how many people had positive and negative experience with KDETools OST to PST Converter. With that information at hand you should be equipped to make an informed buying decision that you won’t regret. What are KDETools OST to PST Converter pricing details? What integrations are available for KDETools OST to PST Converter? If you need more information about KDETools OST to PST Converter or you simply have a question let us know what you need and we’ll forward your request directly to the vendor.